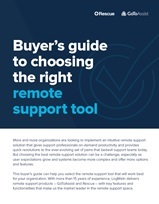 Choosing the best remote support solution is challenging as user expectations grow and systems become more complex. We share the 5 factors you need to consider when evaluating a new solution to help you on your journey. As a bonus, you will also get a useful checklist to help you compare various solutions. With a long history of supporting desktop computers and laptop devices, IT and technical support organizations often discount the need to offer services for mobile devices. This type of thinking can be dangerous. Find out the fact from fiction today. There has been a huge shift in the workplace around mobility. 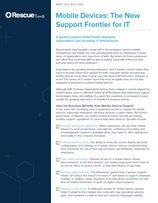 Smartphones and tablets are now essential work tools, and employees turn to their IT teams for mobile device support. 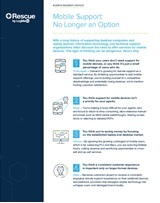 Customers expect support organizations to keep their mobile devices running efficiently and effectively. 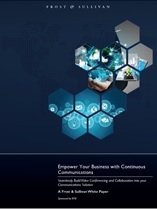 These 4 leading organizations deliver exceptional remote support anytime, anywhere. Today's enterprises demand remote tech support that's quick, easy, and effective. Yet, a surprising number of solutions are still slow, cumbersome and incomplete and organization using them are losing time and money. 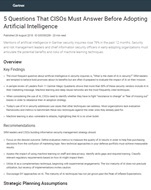 With the ever-changing threat landscape, certain software applications have become difficult to detect and define as potential threats by anti-malware technologies. This type of application is commonly known as a Potentially Unwanted Program (PUP) or Potentially Unwanted Applications. These applications can open users to vulnerabilities and risk; learn how to recognize these types of applications to protect against the potential risks. Key technology trends and user preference shifts are changing the way businesses communicate and collaborate. Enterprise solutions must be simpler to deploy, more intuitive to use, and enable users the ability to collaborate wherever they are. Having an open, services-based infrastructure is important. Integrating all of your new communications and productivity tools to deliver value and simplicity is paramount. 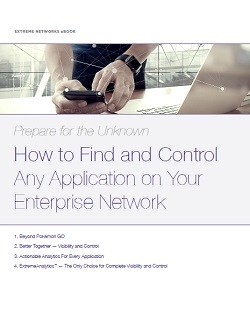 This eBook will explain and show how the ExtremeAnalytics Platform uses the industry's first flow-based technology to deliver unprecedented network application insights for every network environment to help enterprises understand, see, and control what is on the network today and prepare for tomorrow's BYOD threat. What do you need to look for when identifying, evaluating, and implementing mobile app security testing solutions? Choosing the right solution depends on a number of factors. This guide shares key concepts regarding testing coverage, reporting, process, and ROI, as well as key vendor questions to help evaluate technical capabilities essential to mobile app security testing. 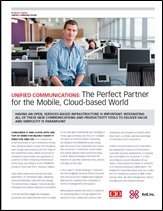 The 8x8 Communications Cloud combines unified communications, team collaboration interoperability, contact center and real-time analytics in a single open platform that integrates across clouds, applications and devices, eliminating information silos to expose vital, real-time intelligence. Interop is the leading business technology event. With the most comprehensive IT conference and expo available, business and technology leaders attend Interop to learn about all the latest innovations and how to leverage technology to drive business value. Top technology companies exhibit at Interop to reach the most active IT buyers in one place. LogMeIn is a leading provider of on-demand, remote-connectivity and support solutions to small businesses, IT service providers and consumers. Businesses and IT service providers use LogMeIn's solutions to deliver remote end-user support and to access and manage computers and other Internet-enabled devices more effectively and efficiently. Consumers and mobile workers use our solutions to access computer resources remotely, thereby facilitating their mobility and increasing their productivity. Our solutions, which are deployed on-demand and accessible through a Web browser, are secure, scalable and easy for our customers to try, purchase and use. Since our inception, our users have connected over 50 million computers and other Internet-enabled devices to a LogMeIn service. NowSecure is the mobile app security technology company enterprises trust to help them deliver secure customer experiences through mobile apps and manage risk associated with mobile-centric workforces using dual-use devices. NowSecure delivers mobile app security testing, mobile app certification, third-party mobile app vetting, incident response, and compliance solutions.